I have loved Anime before Anime was called Anime here in the United States! When I was a kid (many moons ago when dirt was new & dinosaurs roamed the earth) it was called Japanimation. I grew up watching "Kimba the White Lion", "Robotech", and the "Unico" movies. Yup, I'm old! "Sailor Moon" came out here when I was in high school and I used to watch it with the little girl next door that I babysat because she didn't make fun of me for liking Shojo Sparkles. It's been a life-long love for me. Fun Fact (picture on right): Length of train - 4 1/2 feet. Length of hat train - 6 feet. Sarah perfected a foot-sweep maneuver so she could avoid having people step on her train! The purple top of the hat is a plastic CD spindle cover with fabric layered over it. It was cheap and easy! I think the first actual cosplay I ever did (not knowing that cosplay even exsisted) was the charater Cutter Kinseeker from book 3 of the Elfquest graphic novels clear back in eighth grade for Halloween. (1992) After that, I focused on sewing for theater, including a stint as a stitcher and run crew for the Utah Shakespearean Festival for several seasons. After that, my friend Natchan asked me to help her with a costume for San Diego Comic Con. It was Miss Relena from Gundam Wing. As soon as I started working on it, I was hooked!!! I loved dressing up, and I loved Anime - what could be a better combination for me? 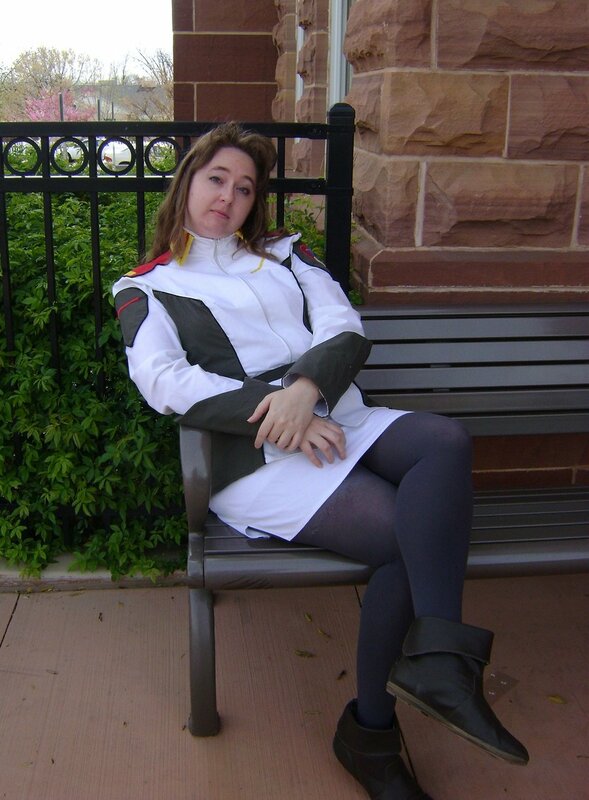 ﻿﻿Fun Fact (picture on left): "I love the Gundam Seed cosplay mostly because it requires no corset or petticoat! I can also use my own hair [and it is] comfy too. Now if only I could shoot whomever decided that women in combat situations should wear pencil skirts! What were they thinking?!" - Sarah Hall. What is your favorite part about the Anime Fannatiku Club? Interacting with the club members! They are the best! We have members as young as seven and as old as. . . Well I'll be nice and just say they're older than me. It's fun to see everyone relax and enjoy being a part of a group that has similar likes and interests as everyone else. They are such a welcoming group, too! I love 'em! What are some challenges you and Natchan, the head of Fannatiku Fest, have run into while working with the Fest? It's also tough to get vendors to come to a tiny convention. They don't like to travel if they know they aren't going to make mega-bucks. Some vendors also have contracts with industry companies that limits them to only attending large conventions. But we like being a tiny con, so we do our best to find a wide variety of stores willing to come and sell their wares to our attendees. What has been the hardest cosplay you have created and what so tough about it? Photo taken in the Anime Los Angeles green room. All the blue edging is hand sewn! 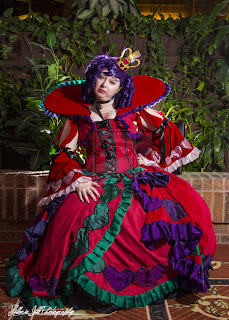 Single Cosplay: Vivaldi, the Queen of Hearts from "Heart no Kuni no Alice" (Alice in the Country of Hearts.) It was tough for many reasons. First, she has four or five different colors of red that she wears at the same time, and they all blend well to make a really cool whole that doesn't overwhelm the viewer with any one particular shade. Finding that many reds that worked together in the type of fabrics I wanted was daunting. Then all of her hearts and pleated trim variegates from green to purple and back to green. They don't make sparkly fabric that does that -- at least not that I could find in Southern Utah. I double-layered it all with transparent iridescent fabric. The pattern went: purple on purple, purple on green, green on purple, green on green, green on purple, purple on green - over and over ad nausium. Then I had to applique on all those hearts. Can I tell you how tired I am of pinning and sewing hearts? Group Cosplay: The art book versions of Trinity Blood. Blingfest! Trimfest! Handsewing as far as the eye can see! Aaaaahhhhhhhh!!! Don't kill yourself right out of the gate. Be reasonable. 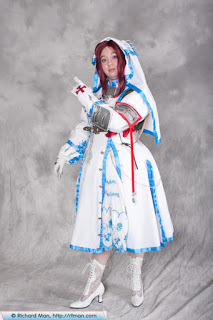 If I had attempted Trinity Blood or the Queen of Hearts as one of my first projects, I would have hated the whole thing and quit cosplay before I ever got very far. 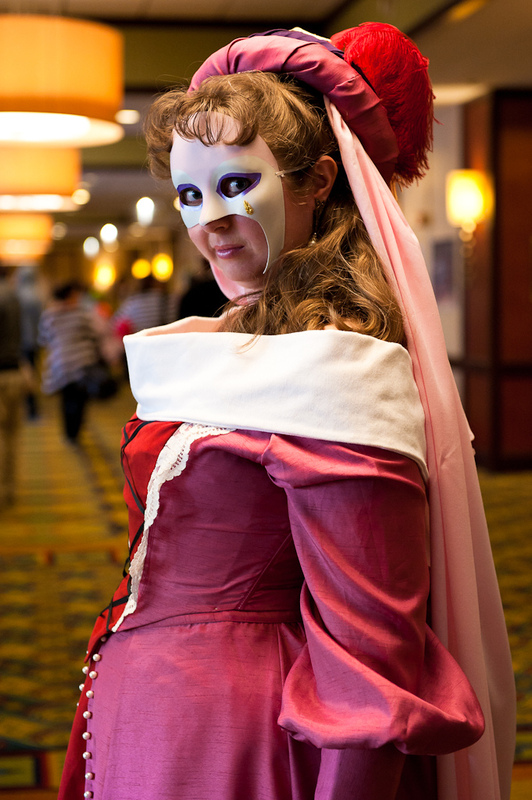 Cosplay is supposed to be fun, not something that destroys any self-confidence you have. Challenge yourself - don't kill yourself!